At the San Jose subZERO art and music festival. Your intrepid PL in disguise as a working stiff with a typewriter. Very stiff this morning! Thanks for David Perez for the chance. 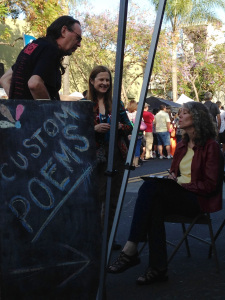 Los Gatos Poet Laureate Erica Goss listening to “Custom Poems” customers.